The NuPrime DAC-10 is identical to the superlative NuPrime DAC-10H, but for people who don't need headphone listening, it lacks the DAC-10H's balanced headphone amplifier. The DAC-10 distinguishes itself from the stacks of high performance DACs that are currently cluttering the marketplace. NuPrime recognizes that merely supporting standard sampling rates and hi-res music formats using state-of-the-art chips or proprietary digital signal processing is not sufficient. To satisfy the most discerning audiophiles, the NuPrime DAC-10 delivers the utmost detail during a symphony’s quietest passages or a soundtrack’s heart-pounding explosion. And it accomplishes this in the most natural sound. It is a truly musical device. To meet the requirement of audiophiles who want to eliminate extra components in their system, the DAC-10 incorporates a high-end preamp capable of driving the power amplifier directly. The DAC-10 includes features borrowed from the Reference class P-20 preamp, including an advanced, thin-film switched-resistor ladder network for controlling volume, which provides a single resistor in the signal path at any volume setting. It also has individually adjustable volume on each input for precise source level matching and volume adjustment in 99 precise, 0.5dB increments. As the heart of an audio system, the DAC-10 supports an extensive number of inputs and formats. Utilizing the world’s best performing 32-bit audio DAC is only a first step for designing the ultimate DAC. 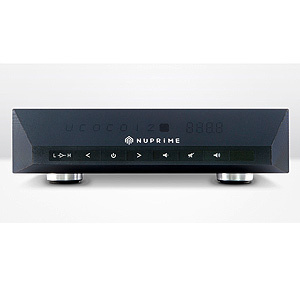 The experience and proprietary know-how in designing many "Editor’s Choice" and "Product of the Year" award-winning products elevate the NuPrime DAC-10H above the competition. 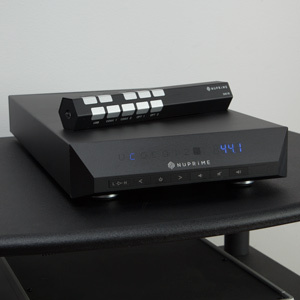 Notable features include five digital inputs and two stereo inputs for system flexibility. 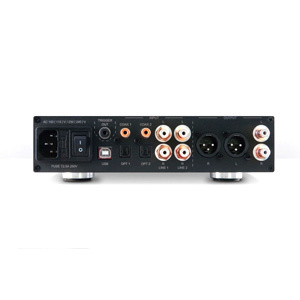 Inputs consist of one USB digital, two coaxial digital S/PDIF, two optical digital S/PDIF, and two analog stereo RCA. Outputs consist of optical digital (up to 24 bit/192 kHz), unbalanced stereo RCA line out, and balanced stereo XLR pre-out. On the output side, it offers unique dual gain settings for RCA with 2V or 4V outputs, XLR with 4V or 8V outputs. The SABRE32 Reference ES9018 from ESS Technology is the world’s best-performing 32-bit audio DAC solution for high-end consumer applications and professional studio equipment. With ESS’s 32-bit Hyperstream™ DAC architecture and Time Domain Jitter Eliminator, the SABRE32 Reference DAC delivers an unprecedented dynamic range of up to 135 dB and THD+N (Total Harmonic Distortion plus Noise) of -120dB, all of which put the DAC-10 at the industry’s cutting edge. The DAC-10 supports DSD native playback by ASIO2.1 (up to 11.2MHz) and DoP (up to 5.6MHz) method and sample rates of 44.1, 48, 88.2, 96, 176.4, 192, 352.8, 384 kHz and DSD64 to DSD256. Other features include a linear power supply with a multi-rail toroidal transformer, independent left/right channel power supplies, a 12V trigger output, and full microprocessor control with memory retention. A wireless remote is included. 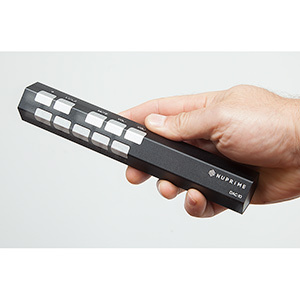 The DAC-10 is offered in stylish black or silver anodized aluminum finish.